I had a complicated planning of my trip home to Davao last August. First I wanted a tour of Leyte and of course that will also mean a tour of Surigao. I was interested in the last because I wanted an update on the Surigao Strait ferries that were transferred to Verano port because of the quake damage to the Lipata port. I ruled out early a direct ferry to Surigao although I wanted to try the Lady of Love of Medallion Transport which was new on the route. The reason is I do not want a 4am arrival. That arrival affords no good ship spotting while approaching the port and it is too early for the Boulevard boats and Siargao ships. I would then have to wait a long time which tends to sap me (and include to that the lack of sleep). And so I thought the best would be a ferry to Liloan as there was news that Gabisan Shipping would soon be serving the Cebu-Liloan route. But when I inquired with their ticketing booth in Pier 3 they told me they were not serving the route yet. I did not want a route via Hilongos or Bato. The reason is I am a late sleeper and the ferry arrives there as early as 3am. Good if I am bound for just some town in Leyte. But since I am still going all the way to Davao again that will sap me. I know that from my experience when I go direct from Naga to Daet. I wait for the night bus to Leyte and on my first night I have no good sleep since I have to wake up, go down the bus, queue in Matnog and then board the ferry. Usually by the time the bus arrives in Matnog I haven’t slept yet. That is the reason I arrive in Davao fagged out. I am getting old and I noticed that as the years pass it seems my body can’t take it anymore. And that is the reason this later years my tendency is take the Masbate and Cebu route for then I can rest and ship spot first in Cebu. But sometimes I miss the eastern route already. But, oh boy, it is really tiring. Maybe one of these days I’ll try to sleep again in Sogod. I then planned a separate Leyte tour for I wanted bus shots (regarding the ships those can be caught in Cebu). But I thought I will have a companion and if I had one the conversation and companionship perk me up and somebody can watch over me and so I thought a Cebu-Leyte-Surigao trip was feasible. But sadly it did not materialize. And so I just substituted a Bohol trip for that and substituted Bohol buses for Leyte buses (the ships of Bohol can also be caught in Cebu). I thought I will be going home July but then the month of August came, my birth month. I asked Trans-Asia Shipping Lines if their birthday promo is still offered. Yes it was and so I will have a discount equal to my age which is sizable. It was tempting and besides I noticed from AIS (Automatic Identification System) that the Leyte-Surigao ships were back in Lipata port. And that complicates Surigao ship spotting. Covering both Verano and Lipata is too tiring since covering Verano means also covering Boulevard and that port nestled by the southern end of Verano port. If I ride the Surigao Strait ferry I will end up in Lipata port and there is no way I can enter Verano port since it is an ISPS port. The lure of Surigao suddenly weakened in me. And so to maximize I just planned to take the Trans-Asia Shipping Line ferry that emanates from Cebu and drops by Tagbilaran first before going to Cagayan de Oro. I will have a good view of Pier 2 and Pier 1 from the sea and I can also cover Tagbilaran ships. This is a once a week trip and I wanted to take it since I have not ridden the Asia Philippines yet. I also wanted to compare her with her sister ship the Danica Joy 2 of Aleson Shipping of Zamboanga. I got the ticket with a big discount but sadly my trip did not turn out pleasurable for me. I was early at the port, in fact too early for the shuttle because I wanted to maximize my ship spotting inside the air-conditioned Terminal 2 in Pier 3 and so at before 9am I was already there for the 12nn departure. I did not bother taking a meal there because the offering was not really good unlike in Pier 1 and I space my meals well. Then I noticed that instead of the first shuttle two hours before departure there was no shuttle until almost departure time and I almost missed the shuttle because the Trans-Asia man who promised to remind me if there is already a shuttle forgot his promise. This is the old unreliability I noticed about the mga tagamasahe ng bakal that pretends to be in passenger service which should have been replaced long ago by hotel and restaurant management graduates. But shipping companies won’t do that because cadets are free and even pay them while they have to pay true crewmen who have the proper qualifications. Dennis Uy of Chelsea Shipping or more exactly Udenna has promised greater value for the stockholders and the customers with his acquisitions. I want to see if he really knows shipping stuff and if he is true to his word and hire the proper personnel. The reason for the late shuttle is because it turned out that Asia Philippines will leave very late. We were there alright, just a dozen of us passengers and then we left at past 3pm when the scheduled departure time was 12nn. Reason was bunkering. Now why can’t they do that well before departure time? Isn’t that inefficiency and callousness to passengers? The crew were already well in their siesta and yet we were not leaving. The first palusot (lousy but false excuse) of a deck officer was there was still cargo loading. It was only later that he admitted the reason for the great delay was the refueling. This is another long experience of mine with the old crew of ships which have not upgraded. They will tell you straight lies or give you the runaround. Well, I hope Dennis Uy, my kababayan is up to the task of changing these old practices if he really wants more value for the customers. And so after a some rest I went down even though the sun was still too hot so I can ship spot from the wharf. It was the start of the peak of cargo handling of the nearby Trans-Asia vessels already. While walking around the deck officer who lied to me ran after me because he was worried I might have an accident with all the cargo handling around me. I said I don’t care and the forklift operators have eyes anyway. He told their port captain will get angry and I told him I don’t care not the slightest. When I am angry I don’t care who’s in front of me and if a port captain will show his face in front of me I will just berate him. He definitely failed to have a ship under him to leave on time, didn’t he? What can he do to me anyway? He doesn’t have any valid reason to deny me passage and of course he and the company doesn’t want a court case. And so the deck officer kept following me around and begging me. I liked it. I have a security around and of course the forklift operator won’t bump a deck officer. But I didn’t stay long in the wharf anyway. The sun was too fierce and I do not want to get too sweaty as Davao is a long way ahead and I have already noticed that the toilet and bath of Asia Philippines is not really meant for showering. I was upset because instead of a good ship spot in Tagbilaran we would arrive at night and there goes that chance. I know the ship then will be trying to make up for lost time and I won’t have enough time to roam around or even look for a good meal outside the port. The vendor finally woke up and of course I will have my pro forma apologies but I explained to him the situation straight without really backing down from my point that it is duty time already for him and they must serve the passengers and it is not our fault if the schedule was awry. I also told him I am a diabetic and I have taken my insulin shot already. At the time I banged repeatedly his enclosure we should have been in Tagbilaran already and I should have been free looking for better food. And his canteen should be serving since the ship is running. The rest of the way I noticed the crew was treating me gingerly and they were even greeting me “Good afternoon” or “Good evening”. Sometimes it really pays standing up for one’s rights and putting them on notice and challenging their lousiness. I pitied my other co-passengers including an old foreigner married to a local lass who was with the extended family. Before arriving in Tagbilaran they were already asking about hotels. If the ship left on time there will have been still buses and commuter vans in Tagbilaran. Now all those disembarking in Tagbilaran (and that is most of the dozen passenger passengers) have a problem already since we docked nearing 8pm already and by that time trips in Tagbilaran terminal which is of some distance to the port have mostly been gone already. Docking in Tagbilaran port I tried to get shots although it was frustrating. I queued when they were still fixing the side guards of the gangway and someone told me not to get down as the ship will not stay long. I cocked my head and the crewman retreated. My thought then was the officers of the ship need a good seminar on how better-run ships are managed. They have been too bogged down for long in lousiness and lack of understanding of passenger service. They are stuck to old ways and maybe they have not realized they were not respecting the passengers as they should have. Maybe they think they are doing enough passenger service when in fact when one is demanding it already they all slink away, the exact opposite when one looks for passenger service in 2GO (they have a quick, “Yes, Sir?” when it look like someone needs assistance). Now with the full acquisition of Udenna of 2GO and Trans-Asia Shipping Lines it is high time for the crew of Asia Philippines to be rotated to a 2GO liner and for 2GO crewmen customer service personnel to be assigned to Asia Philippines. This is my free advice to Dennis Uy. I roamed Tagbilaran port up to the passenger terminal building. I was able to buy some souvenirs but of course my shots were limited and at that hour there was no more point going out of the port. There were many passengers for Cagayan de Oro even in Tourist and I was told that is the usual load of Asia Philippines whose regular route is Cagayan de Oro-Tagbilaran. Of course it is well-known that there are many Bol-anons in Northern Mindanao and the Dipolog Princess of Sulpicio Lines that has a route to Iligan is already gone. I didn’t stay too long down. It was hot, stuffy and dusty because sand is being unloaded from a big LCT into waiting dump trucks. I asked where it came from and they told me it is Butuan and the sand was for use in the construction of the new Panglao airport (it is not in Tagbilaran by the way). Yes, Bohol island with its upraised sea floor origin like Cebu island is lacking for sand which is bountiful on places with volcanic origin like the areas around Mt. Mayon (but then the soles of shoes don’t last that long there). I don’t know what time we left but the pooh-poohing of me not to stay long down again was the usual overreaction of a crew who does not want to be looking for a missing passenger. I thought in the older days they used the ship’s horn for that? No more? Whatever it was obvious Asia Philippines no longer runs fast and can no longer make up for lost time (imagine those waiting too in Tagbilaran port who might have been there are as early as 4pm and boarding time was already near 9pm). It was already 7am when we docked in Cagayan de Oro. The only good thing is there was enough light for shots but I am not too enamored with Cagayan de Oro port if there are no liners around (just freighters unlike in the past when there were still many ferries). Of course the Lite Ferry 8 was already there ahead of us (we left her in Cebu the previous day). I also realized it is good I did not bet on direct Trans-Asia 9 from Cebu because when I disembarked she was still nowhere in sight. I look in pity at the gantry cranes of Cagayan de Oro. Too much ahead of its time. There are not really enough container vans being unloaded as other ships are using PHIVIDEC port in Villanueva, Misamis Oriental (and Cagayan de Oro is not a favorite of the regional container ships). Maybe they should just transfer it to Sasa port of Davao where a lot of container vans are handled and even more than that of Cebu port. A new port terminal building is being built in Cagayan de Oro port. Long overdue, I say. For too long they were just using a converted transit shed like in Makar port of General Santos City (a port terminal building was approved there when there were no more liners – now what kind of planning is that?). Imagine Masbate port getting a port terminal building ahead the them when it is not really needed there. As usual I stayed clear of the very overpriced motorela of Cagayan de Oro. I just wonder why up to now the Land Transportation Office (LTO) and the city government of Cagayan de Oro can’t stop their fare gouging (because the drivers bring in votes during election time?). Lucky there was a Multicab waiting but then like usual I will ask the fare first. Regular fare and so I rode up to the Agora terminal where the buses for Davao can be found. There were commuter vans outside Macabalan port for Davao and various other points but I did not take them because I still need to take a good breakfast and I want time in Agora terminal to take bus photos. I resolved that this time I will take the Super Five bus. Not for any particular reason except that I already rode Pabama Transport last time. One thing I won’t ride is a Rural Transit bus. Oh, how I hate monopolists from the point of view of principle. But from Maramag town I know I will have to ride them since there is no other option. In Maramag terminal I tried looking for a commuter van but the ones there were not attractive. The Maramag-Davao commuter vans are old ones with no good air-conditioning and one can’t be sure what time they will leave. A van might have a better vantage for bus shots but after Maramag I am no longer interested in bus shots because all the buses there are colored red. I arrived in Davao when night was already falling. And to think we left Cagayan de Oro at 9:30am and we did not have a meal stop (meal stops and coffee stops are the specialty of Rural Transit buses, one of the reasons why they are slow). And I just waited for 20 minutes in Maramag, just enough to take bus shots. Buses as the years go by tend to be slower. Where are now the fast drivers of the past, I wonder? Seems the Yansons killed them. My trip home took 34 hours from the time I left the place of my son in Cebu. I said by accident because it was not really done based on a plan. As of yesterday I was not even sure on going to Samal because I was wary of the tight security because two Heads of State (President Rodrigo Duterte of the Philippines and President Joko Widodo of Indonesia) will be in Kudos Port in Panacan, Davao City near the President Duterte office in Davao or what is called as “Panacanang” (the question was how near one can get without some sort of official pass) and I was sure there will be suspension of voyages for some hours. And I thought Aris Refugio, the superb Samal ship spotter will have a better vantage point than me although what he needed might be a superzoom cam. What attracted me, however, was the knowledge that there will be plenty of ships around because even yesterday there were already nine ships off Sta. Ana port in what me and Aris call the “South Davao anchorage”. I already noticed the bottling of ships and I was sure it will be more bottled today since three Chinese warships were coming to Davao. I was actually amazed by the coincidence of the inauguration with two Heads of State and the coming of three China warships (were the Chinese ships there for additional security?). But I decided to go anyway this morning. The Chinese warships were attraction enough and the knowledge of bottled ships was the bonus. I went not for the inauguration because I was not even sure of the schedule or what will happen. I thought the event will be confined to Kudos Port and there was no decent way to approach it when the two Heads of State were there (and it turned out the First Ladies were also there). I did not go to Sta. Ana Port. In the morning the shots there are lousy because the cam is against the sun. I thought it would be best to cross to Samal because Sasa Port is best covered in the morning as the sun will be behind me. And if there are ships in Pakiputan Strait aside from Sasa Port it will be bonus. Plus if there is some happening in Kudos Port that is visible it will be another bonus. I got off at Mae Wess Port. The passenger queue was up to the gate. It was hot and humid but since I was there already I waited a little. But somehow I guessed I was in the wrong place and I backed out and went to Km. 11 Port. I thought the queue there is shorter although the boat’s run is further from Sasa Port. There was also a queue there alright but shorter. After a few minutes I decided to move ahead of the queue to see what was happening in Pakiputan Strait. And I was lucky. 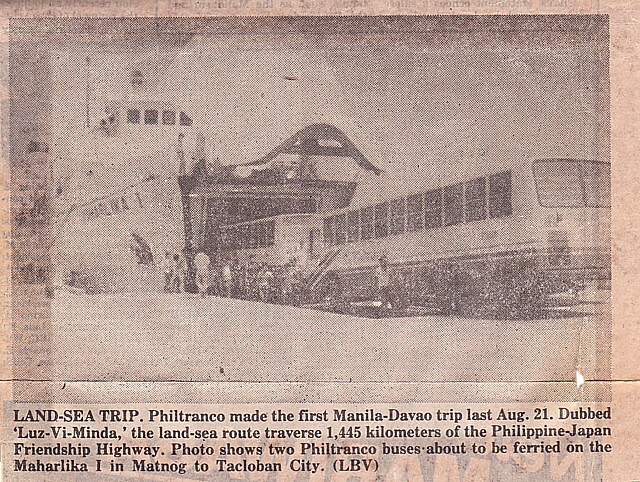 The inaugural run of the Super Shuttle RORO 12 of Asian Marine Transport Corporation (AMTC) was just beginning and I have a good vantage point that was not against the sun and was not too far. There were many tugs accompanying Super Shuttle RORO 12 and they were giving her the “water salute” which means a water spray that is not really aimed at the ship but instead is just a light plume. This ceremony is given by tugs during important departures or arrivals. I was not sure how far the tugs will accompany Super Shuttle RORO 12. I was not even sure if the RORO Cargo ship will just then go back to port. In the vicinity there were also Coast Guard and Navy ships. It seems they were taking the security of the two Heads of State and other VIPs very seriously. Then the convoy turned to starboard. The thought that the ship might really sail already crossed my mind. I had to get inside Km. 11 Port because the structure is already threatening to hide the convoy. I asked permission from the Coast Guard and they readily acceded and I had the full use of the wooden port to get good angles. I felt what a lucky day! As I thought the voyages of the ferries between Davao and Samal were suspended. I thought if I waited in the queue in Mae Wess Port there would be no chance to get aboard its ships and use it as a vantage point. So I silently thanked my lucky stars. However, two motor boats from Babak Port crossed the convoy and one just by the bow of Super Shuttle RORO 12. I thought the Coast Guard in Babak Port did a lousy job in making sure that no ships will cross the convoy. By this time some of the tugs were beginning to fall back and there was no longer a water spray. I noticed the LCTs and double-ended ROROs of Mae Wess were already drifting to Km. 11 Port. They wanted to cross right after the convoy passed. But there were still tugs trailing plus the Coast Guard and Navy ships (well, their base was actually in Sta. Ana Port a few kilometers down south and they probably have to tail Super Shuttle RORO 12). By the time the ship leveled with Sasa Port, some of the tugs have already stopped or have already gone back. The tug that was accompanying the ship long was the Super Shuttle Tug 1 which also belongs to Asian Marine Transport Corporation. Eventually she also dropped back and so i thought Super Shuttle RORO 12 was really on her way now to her first voyage. I then decided to take a motor boat to Babak Port to get a longer and a different view of Super Shuttle RORO 12. The crew of MB Ruby gave me a good vantage point when they realized I was covering the event. We also had some tete-a-tete. They were knowledgeable about the inauguration. Funny they were even talking about the snipers providing security to the event. When I reached Babak Port I had no intention of staying long. I wanted to cross immediately to Kudos Port to do some interviews about what transpired there and I took the DavSam II which has the same owner as Kudos Port. The crew said they were never able to observe the inauguration since it was done under a temporary enclosure and they also can’t get near. When I landed in Kudos Port I tried to make some interviews with the canteen staff of Kudos Port and with a Coast Guard personnel. Like the crew of DavSam II, they said they also can’t observe the proceedings. And like the crew it seems to them what they noticed first was the water salute. They said the affair started at 9am and security was really tight and they can’t even move from their assigned places. I asked who the VIPs were. They can’t give me an answer. Then I received a text message from Aris that two Chinese warships have already passed the point opposite Quaco. That point is just a half kilometer from Sasa Port. So finally I knew where Aris was and it seems he was able to cover the Chinese warships more. That was good as we were not duplicating efforts. So I then hied off back to Km. 11 Port. I knew I will be able to capture the ships there as they are docking and I was not wrong. However, the restaurant ship The Venue of Mae Wess was beginning to spoil the view early. I wanted to go to Mae Wess and ride a ferry to Caliclic but I did not like the queue and I thought Aris will be able to cover it from Caliclic anyway. No, he ran out of batteries. And we were not able to communicate well because my cellphone battery was very low too. I thought there was still tomorrow to cover the Chinese warships when the passenger volume to Samal is lighter. For sure Aris will be able to cover them docked. So I just went to Sta. Ana Port. The sun is already behind me. There were eight ships off Sta. Ana Port, five of which were not there yesterday. It was not a bad day. A complete coverage of the inaugural run of the ship to Bitung, Indonesia plus two Chinese warships and an assortment of tugs, enforcement ships plus ferries wallowing for they can’t cross. Sometimes an unplanned trip turns out better than a planned trip if one’s stars are aligned.